WASHINGTON -- North American trade officials say harmonizing regulations and improving infrastructure at ports of entry are just as important as trade agreements to facilitate cross-border goods movement. Talks to modernize the North American Free Trade Agreement are expected to start this year, with potentially huge implications for the auto industry. Newly confirmed U.S. Trade Representative Robert Lighthizer officially notified Congress last week of the administration's intention to renegotiate the 23-year-old accord. But if shipments can't easily cross land borders between the United States, Mexico and Canada because of regulatory and other hurdles, the potential benefits of an improved trade agreement will be undercut, the officials argue. 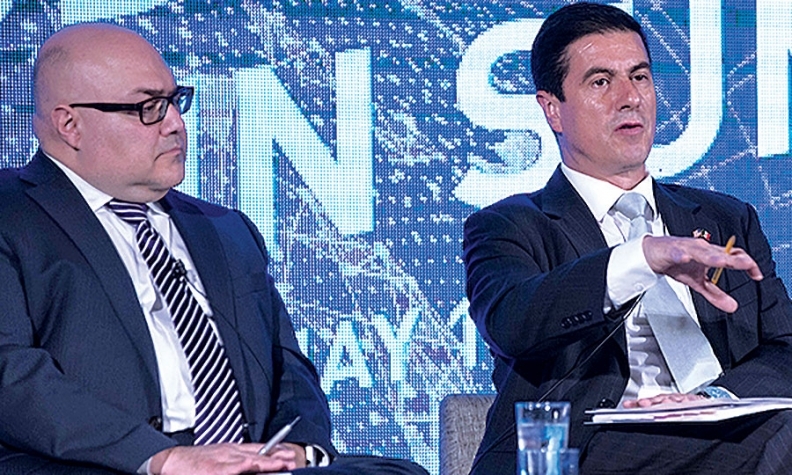 "Trade facilitation and regulatory harmonization are the only way that we can continue to remain competitive," Geronimo Gutierrez Fernandez, Mexico's ambassador to the United States, said last week at a supply-chain forum here hosted by the U.S. Chamber of Commerce. The auto industry has developed a shared production platform in all three countries, and stakeholders envision a day when finished vehicles and components cross international borders as seamlessly as they move across state lines. Inefficient customs clearance, inadequate infrastructure and complex rules -- especially on the southern border where multiple handoffs between long-haul and cross-border shuttle trucks are the norm -- create delays and add costs for manufacturers. Customs authorities in all three countries have worked closely for a dozen years on ways to expedite the movement of goods by removing red tape at borders, but bottlenecks persist. "The biggest single thing that's holding up efficient commerce now isn't so much infrastructure, it's that what's going to the border is unknown to our agents," said Taki Sarantakis, an official with the administrative arm of Canada's Treasury Board. "They don't know whether it's a legitimate commercial activity, or something that's a serious potential threat to our security." One solution, Sarantakis suggested, is to create secure corridors where containers and truck trailers are certified as secure at a factory or government inspection facility, locked with tamper-proof electronic seals that can be tracked to ensure an unbroken chain of custody, and sent on prescribed routes to the border without stopping. Another is to improve on current practices for distinguishing low-risk, repetitive shipments coming from trusted companies so resources can focus on scrutinizing unknown and suspicious shipments. "If a GM factory in Detroit, like clockwork, sends four trucks a day over the bridge from Detroit to Windsor [Ontario] and three back the other way, is that really a high-risk thing?" Sarantakis said. "Is that something that really warrants secondary inspections?" Pre-clearance is a key facet of an initiative the United States and Canada adopted to make their shared border more free-flowing for lawful trade and travel, but implementation of the measure so far has been very limited. A similar U.S. initiative with Mexico has led to some cargo pre-inspection operations on the southern border. Kevin McAleenan, acting commissioner for the U.S. Customs and Border Protection agency, said pre-inspection by U.S. officers on the Mexican side of the Nogales, Ariz., checkpoint has reduced truck wait times from three hours to 30 minutes. Homeland Security Secretary John Kelly endorses the idea of "thinning the border," and McAleenan stressed that uneasy diplomatic relations with Mexico over comments by President Donald Trump haven't changed operational partnerships with Mexican Customs in any way. McAleenan said the Customs and Border Protection agency expects to be at the table in upcoming negotiations on NAFTA and other trade deals, which has not always been the case in past administrations. The agency is tasked with enforcing trade deals, so having it involved can help negotiators understand the real-world impact of rules changes as well as private-sector needs, he explained. An elusive, politically challenging goal is to harmonize safety and other regulations on each side of the border so companies don't have to waste time and money complying with different sets of requirements. "Data indicates that anywhere from 2 percent to 10 percent of the cost of goods comes from regulatory efficiencies. "Imagine the reinvestments we can do if you knock [that] off the price of a typical good," Sarantakis said. President Trump has made it a priority for his administration to roll back domestic regulations, which he characterizes as an unchecked burden on business. Gutierrez, the Mexican ambassador, said the trilateral partners should realistically strive for 90 per cent regulatory alignment. He recommended setting goals and deadlines to achieve that for each industry.